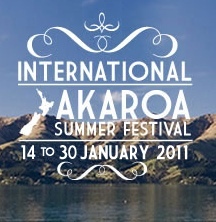 After the success of 2008, 2009, and 2010, the 2011 Akaroa Summer Festival is designed to stimulate, educate and enthuse advanced young musicians from all over New Zealand and abroad. An array of distinguished international musicians and tutors will provide inspiring daily lessons, masterclasses and concerts. These intensive 17 days of music making will also offer solo performances, chamber music and a string orchestra in one of New Zealand’s most breathtaking seaside towns where work is mixed with pleasure. Students are invited to apply on the following instruments: violin, viola, cello, piano, harp, recorder, flute and bassoon. Do not miss out on this experience of the excellent Akaroa Summer Festival in the heart of the remarkable Banks Peninsula. Included in this concert - Kegelstatt - is Inner Bellow by Christchurch composer Chris Cree Brown. This piece has also received the 2010 SOUNZ Contemporary Award, and was premiered by Gretchen La Roche in April 2010. Other pieces on the programme include Balkan Dances by Marko Tajcevic, Trio in E flat Major KV 498 for piano, clarinet and viola 'Kegelstatt' by Mozart, and Piano quintet by Gabriel Fauré.